The final day of action went into the books today as the first event of the 2016 United States Pro Kart Series is now complete. Nearly 160 entries filled the eight categories that took to the popular New Castle Motorsports Park in central Indiana. After battling cold temperatures for all of Saturday, the sun finally shined throughout the day on Sunday, although the wind stuck around to keep temperatures well below normal. The temp on-track was heated up as the final laps of the weekend crowned the Round Two winners, setting up the early championship contenders. Saturday’s Franklin Motorsport IAME Pro winner Braden Eves looked to have another victory on the horizon as the day went on. The MDD / Kosmic pilot was the top qualifier and came away with the win in both heat races from the pole position. Eves broke away early to establish a solid lead in the main, only to be run down by Brandon Lemke (Merlin) and Brandon Jarsocrak (Praga). Lemke took control on lap four, while Jarsocrak followed him through a few laps later. Eventually, a few laps of them shuffling for the lead helped to bring in Zach Holden (Tony Kart) and Armin Cavkusic (FA Kart) to the mix. Holden, posting the fastest laps of the race, worked by Jarsocrak and then Lemke. The Koene USA driver led for a lap before Lemke retook the position from his fellow Senior rookie rival. The move established a gap for the Franklin Motorsports driver, as Holden worked to recover. In the end, Lemke was able to hold off the final charge from Holden to earn his first USPKS Pro victory of the year and a $1,000 payday. The rookies went 1-2 as Jarsocrak fought his way back to the third after getting dropped back to fifth. Cavkusic moved to fourth while Eves crossed the line in fifth. Jake Craig (Praga) drove up from 11th to sixth and Austin Garrison (Compkart) was also on the move, finishing seventh after starting 15th. Elliot Finlayson (Tony Kart) earned the Deep Seat Hard Charger award and $100, coming from 22nd to ninth behind TJ Koyen (Exprit). Olivia Horn (Tony Kart) rounded out the top-10. Throughout the weekend, finishes at the New Castle facility came down to the wire, especially with the new location of the start-finish line at the end of the ‘Long Pond Straight’. Not surprisingly, the Comet Racing Engines Yamaha Pro main event went down to the wire with a three-wide photo finish. Top qualifier Dakota Pesek (Top Kart) was joined at the front by heat winners Zach Holden (Tony Kart) and Jimmy Simpson, who was running a borrowed Tony Kart for the weekend. The trio pulled away early on in the main event, setting up for a run in the final laps. On the last lap, Pesek was leading with Holden in second, that is, until Simpson made a bold move at the I-70 corner to go from third to first. He and Pesek pushed wide on the exit which allowed Holden to drive around for the lead as they went through the kink. Coming to the line, the three spread out wide, all gunning for the stripe. At the checkered flag, Simpson was able to get a run and cross the line first by 0.027 seconds. Holden thought the win was his until the final few inches, as he ended up second with Saturday winner Pesek in third. Nick Landi (Tony Kart) won the battle for fourth, edging out Brandon Lemke (Merlin), Jake McWhirter (Tony Kart) and Adam Crepin (Tony Kart). A three-driver breakaway would decide the winner in the Innovative Performance IAME Junior class. A red flag halted the main event early when Myles Rowe (Top Kart) flipped over. He was uninjured and would continue. 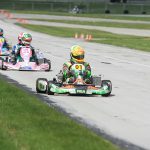 Lance Fenderson (Tony Kart) was involved and was not allowed to restart due to the fact that his crew worked on the kart during the red flag period, which was not a repair time. The race restarted with heat race winners Sam Mayer (Merlin) and Dylan Tavella (Tony Kart) leading the way as Alex Bertagnoli (Merlin) stayed in their draft. On the final lap, Tavella made a bold move for the lead at the I-70 corner, drifting out wide as Mayer slipped back under to assume the lead. The Franklin Motorsports driver went on to earn his first Junior victory by three tenths over teammate and Saturday winner Bertagnoli. Tavella settled for third while Austin Schaff and Stephen Dial put two more Merlin karts into the top-five. Rowe restarted last in the 18-kart field after his flip and drove his way back to ninth, hustling a damaged kart back for a solid result. A wreck in Heat #2 stopped the ‘Zack Pretorius Train’ in the Woltjer Racing Engines Yamaha Junior division, ending the attempt at a perfect weekend. Austin Schaff (Merlin) went on to win the second heat after Saturday sweeper Pretorius (FA Kart) was the top qualifier and opening heat race winner. 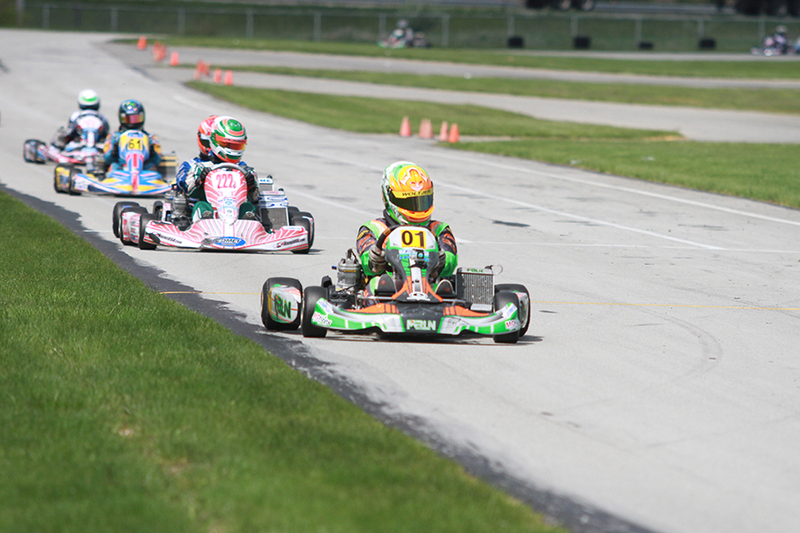 Dylan Tavella (Tony Kart) earned the pole position for the main event after two runner-up finishes in the heats. Tavella was joined at the front by Sam Mayer (Merlin), who fought his way up from P5 on the grid. The two broke away after the fight for third began to heat up, taking full advantage of the scrap going on behind them. The race would eventually come down to the final lap. Tavella had learned from the earlier main event, as he made the move once again in the I-70 corner. 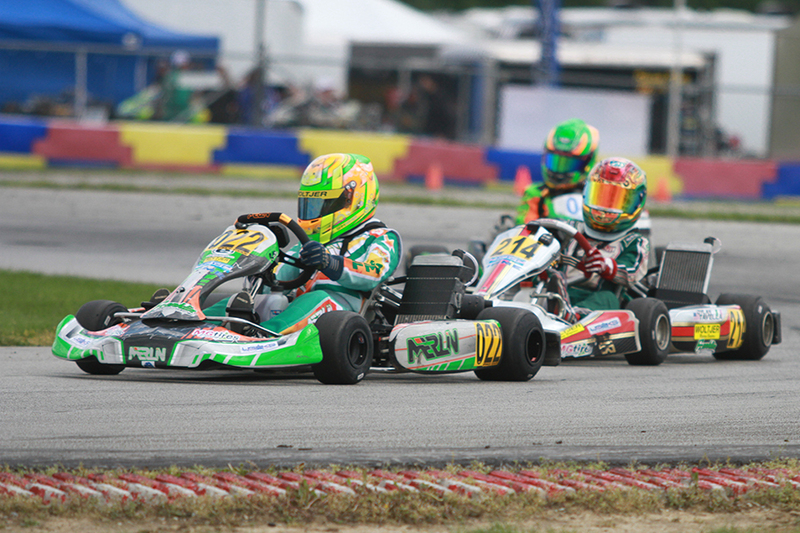 This time, it stuck, as he held off Mayer to the line for his first Junior USPKS victory. Alex Bertagnoli (Merlin) won the fight for third over Schaff. Pretorius drove to fifth, but was penalized one position for contact, moving Sam Paley (Tecno) up one spot in the final tally. 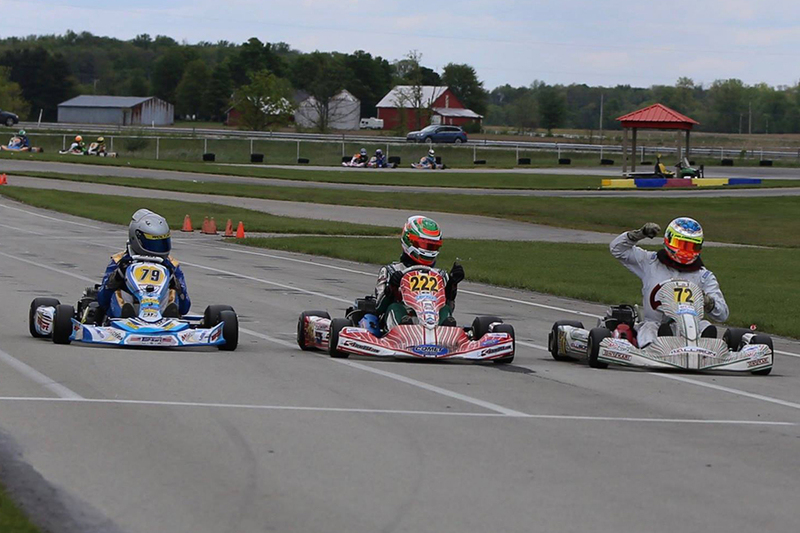 Sunday’s action was a clean sweep for Florida driver Reece Gold in the Allison Racing Engines IAME Cadet category. Securing fast time in qualifying with a monster lap, Gold drove to both heat race wins. The Benik driver was joined at the front by teammate Tyler Maxson. The two worked to pull away from the field, deciding the race on their own. Maxson made one last move heading to the stripe, but came up just three hundredths of a second short to give the victory to Gold. Saturday winner Kyle Thome (Merlin) drove alone in third while Cadet rookie Nicholas Terlecki (Birel ART) and Devin Gomez (Benik) completed the top-five. The Switch Racing Engines Yamaha Cadet division was the last race of the day, as was filled with drama during and after the main event. Logan Adams (FA Kart) earned the pole position and would have Colin Queen (Tony Kart) on the outside of him for the main. After a failed attempt, they were moved to the second row to put Nathan Nicholson (Tony Kart) and Robert Noaker III (Merlin) as the lead starters. When the green flag waved, Adams jumped to first and began setting the pace. The top qualifier would eventually be joined by his brother Garrett Adams (FA Kart) and Heat #2 winner Kaden Wharff (Top Kart). All three pulled away, sizing up for the last lap finish. They began shuffling on the final circuit, and came off the I-70 corner with Logan leading the way. Wharff and Garrett got a solid run off the corner, setting up for slingshot. Both darted toward the inside of the track, making slight contact. Adams nearly went off into the grass but held it straight, as Wharff’s momentum kept him pushing forward. At the line, it was Wharff by eight hundredths of a second. Originally, Wharff was penalized for the contact coming to the checkered flag, but following a protest, the call was overturned and Wharff retained the victory. Logan crossed second, but was penalized one position for jumping the start, moving Garrett to the second step of the podium. Queen won the fight for fourth ahead of Tyler Maxson (Benik). Paige Crawford continued her run at the front of the QPS Employment Group Yamaha Rookie division, scoring her second victory of the weekend. Elliot Cox (Benik) came away as the top qualifier, but Crawford (Tony Kart) won both heat races to start from outside row one. Crawford took the lead from the start of the main event, and paced all 11 laps en route to a 2.3-second advantage and the point lead leaving New Castle. Adam Maxwell (FA Kart) drove to the runner-up spot over Mateo Rubio-Luengo (Kosmic), Cox and Eli Trull (Fullerton). Brent Crews (Exprit) performed his own sweep of the Jay Howard’s Motorsports Driver Development IAME Rookie class. Crews was top qualifier, winning both heat races and driving away to a near six-second advantage. Elliot Cox (Benik) drove to second over Paige Crawford (Tony Kart), Mateo Rubio-Luengo (Kosmic) and Adam Maxwell (FA Kart).